If you’re organising an event that requires a professional atmosphere with a touch of glamour – a press conference, an award night, or maybe a corporate theme event – you need to be selective with the decorations. Each decor you use must be pretty and elegant, and at the same time a subtle advertisement for your company. A fitted custom tablecloth printed with your corporate logo is one piece of decor that can do that for you. Our 8ft fitted trestle table covers are ideal for this purpose. Why should you choose our fitted trestle table covers? Here are three reasons. First, their streamlined form gives them a classy look. Second, their colours are vivid and detailed. Third, they won’t cost you much and will even save you money. The streamlined look of a fitted table cloth gives it a chic appearance. This table cover is not like your grandmother’s billowy kitchen ginghams. This box style of tablecloth stays in place so the table looks neat all the time. The fabric is also thick at 210gsm, thicker than most table cloths available in the market today. The tablecloth owes its rich colours and sharp details to dye sublimation, the printing process we use. Dye sublimation is one of the most sophisticated printing technologies out there right now. In this particular printing process, the mirror image of the graphic to be impressed on the tablecloth, such as your corporate logo, will be printed on a piece of heat-resistant transfer paper. The paper is then pressed onto the fabric using a machine. The heat and pressure coming from the machine makes the ink on the paper transfuse into the fibres of the fabric. The resulting printout is rich in detail and vivid in colour. More importantly, it is permanent and resistant to damage. You’d be pleased to know that this high level of quality comes at a very affordable price tag. That’s because we don’t charge escalating rates for additional colours and we don’t require minimum orders. All our printouts are in full colour, and this won’t cost you extra. Also, if you need only one table throw, then you can order only one item from us. It won’t cost you extra either. 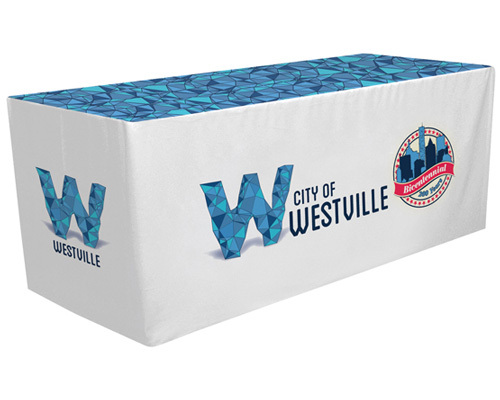 You will also be able to use the tablecloth you get from us as often as you want and for other events such as expos and trade shows. Dye sublimation printouts are permanent. You can even have them washed or dry cleaned safely without the colours fading off the fabric. The biggest benefit you’ll get from choosing our table cover is you get to decide exactly how it is going to be like. You can see that this particular product has a solid background with a single printout. Our table covers with logo are not fabrics in ready-made block colours. You can provide us with the design you want or we can create the design for you. You can pick what colour you want for the printout and the table cover using the Pantone colour chart, a book that lists the various shades of the colours recognised by the human eye. If, for example, you want a brown table cloth, you have to tell us what shade of brown you want – camel, chestnut, chocolate, coffee, copper, cocoa, tan, dirt, desert, earth, drab, fallow, and many others. We offer colour matching for free. We can also do a sample print at your request so you can be sure that you are getting exactly what you paid for. We typically stock regular, four-sided fitted trestle table covers. But for added convenience, you can order a three-sided or “open-back” tablecloth. This is perfect for those events when you will have people sitting behind the table. An open-back table cover will give these people room for their legs underneath the table. Our 8ft fitted tablecloth is truly ideal for those events that require a touch of class and glamour. Call us right now to learn more about this product.